As I sit in the beaming afternoon sun, squinting to see my computer screen, sweating as if I'd just been to the gym for hours, one might see me and wonder why I don't just go inside. The answer is simple: I'm trying my absolute hardest to absorb as much as I can of the last weeks of summer. Treating each day as if it is a mirage, knowing well that a Canadian summer is but a fleeting train filled with sunshine and happiness, I'm making a solid point to be outdoors as much as possible. Unlike many, I don't complain that it's 30 degrees C outside. I don't complain that it's humid. I don't complain that I'm sticky and my skin is glistening with sweat. No, I don't complain. Instead, I embrace it. I know fair well that in less than three months, the temperatures will dip to a number colder than the inside of my freezer, and I'll be praying for these dog days to return. In the spirit of all things summer, I've been eating tons of salad. This afternoon, I decided that I should make something different than my usual spinach and whatever-is-around mixture. Opening my vegetable bin for inspiration, I spotted an almost forgotten sweet potato. Out of the corner of my eye, I also spotted my shiny new jar of Vegenaise. Cook sweet potato as desired - I use the microwave to save on time, but I recommend chopping into cubes and boiling until desired tenderness is reached. Cool potatoes (to room temperature or colder.) Dice cucumbers and peppers. Combine with potatoes. In a seperate bowl, whisk all dressing ingredients. Toss dressing with salad and chopped cilantro. Garnish with additional cilantro if desired. Tip: For a more traditional "potato salad" flavour, add 1/2 cup of sweet corn kernels and 1/2 cup of chopped pickles, if desired. 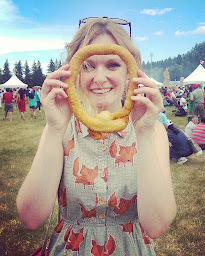 I'm Allison - the chef behind Savoury Sweets Bakery in Montreal! I am so glad that you've stopped by. This is the place where I share my favourite recipes so that you can cook them at home. Stay a while & come back often. Happy cooking! All content and images Copyright 2018 Allison Sklar. All rights reserved.